BambooBeast: Nachdem wir weg gezogen sind können wir den Cache nicht mehr warten. An easy cache in the "Donaupark". The cache is placed in the Donaupark. If you are using public transport, get off at U1/VIC or U1/Alte Donau. From there it is a 10 minutes walk to the cache-location. The cache is at the end of the bridge (but not under the bridge). The cache-container is attached to metal (but not magnetic). ATTENTION: THE CACHE IS NOT AT THE LANTERN - PLEASE DONT TOUCH THE ELECTRIC INSTALLATION OF THE LANTERN! ACHTUNG: DER CACHE IST NICHT BEI DER LATERNE - BITTE DIE ELEKTRO-INSTALLATION DER LATERNE NICHT BERÜHREN! Please bring a pen. Take your time to enjoy the Donaupark. The Donaupark is a 800.000m2 green area next to Austria-Center and Donaucity. Here you can find the Donauturm - the hightest building of Vienna. You can take the express-elevator up to the observation-platform (ticket EUR 5,90), from there you have a great view over vienna. 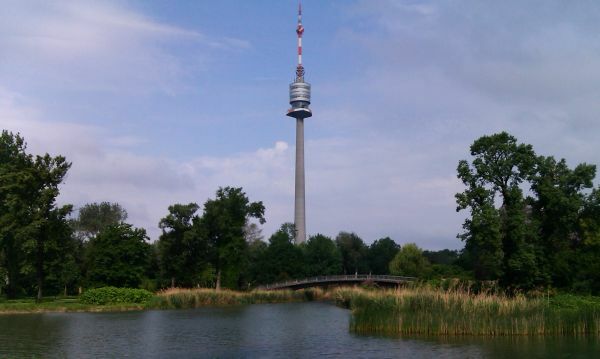 There is one restaurant at the bottom of the Donauturm and a restaurants and a cafe on top. At the Donaupark you can find a large play-field for kids, a skateboarding-park, Schmetterlingswiese (butterflies), a stage (concerts in summer) and many places to relax.